MediMiss chronic obstructive pulmonary disease symptoms copd COPD symptoms lung lung disease What Are The Symptoms Of COPD? COPD symptoms are often similar symptoms of other lung diseases and conditions, so it's best to consult a doctor as soon as you discover something that may indicate you have early symptoms of COPD. This article is intended only to provide basic and introductory information about COPD symptoms to non-medical readers. The United States has two lung diseases categorized under the definition of COPD. They are emphysema and chronic bronchitis. There are generally no noticeable early signs COPD, or chronic obstructive pulmonary disease. Symptoms only start to show after there's been damage to lung tissue. Symptoms of COPD usually get progressively worse after they first begin to appear. You can have COPD and be completely unaware of it - until you notice you're experiencing breathing difficulties after even the slightest exertion. Shortness of breath is often the first clear sign of chronic obstructive pulmonary disease. Another early symptom of COPD is a cough that produces sputum (sputum is saliva mixed with discharges from the lungs and airways). This is known as a productive cough. Such a cough that's not caused by a cold or flu can be one of the first symptoms of COPD. This cough appears every morning at first, but gradually it starts happening all day long. It intensifies as the disease progresses. 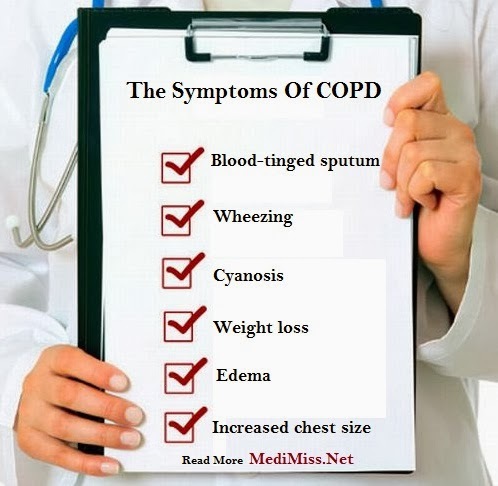 There are various other COPD symptoms, and they usually include the following. Blood-tinged sputum - This is called hemoptysis, and it's one of the most common symptoms of COPD. Most of the time, only small amounts of blood come up from the respiratory system, but it's enough to signal that a problem is developing. Hemoptysis can also be a symptom of lung cancer. Wheezing - This is a high-pitched noise that sometimes may even sound like a whistle. Wheezing is the result of air being forced through air passages that have grown smaller. Breathing with pursed lips - Pursing the lips narrows the mouth, making it harder for air to get out during exhaling. By pursing the lips, the COPD sufferer is unconsciously trying to exhale more slowly, thus keeping the pressure levels in the airways high enough to prevent them from collapsing. Cyanosis - Cyanosis is a medical term for a lack of oxygen. When someone has cyanosis, they literally begin to turn blue. The blue skin shade is usually most noticeable in the nails beds and around the lips. Weight loss - Severe chronic obstructive pulmonary disease burns calories because the body has to work harder to do everything. Struggling to breathe during meals also makes the patient want to eat less. Edema - Severe COPD affects the heart and circulatory system so that blood flows less efficiently, especially to the extremities. This condition is known as edema, and it triggers swelling in the feet. Fluid can also collect in the peritoneal cavity of the abdomen, which is a condition called ascites. Increased chest size - Some people call this condition a barrel chest. Chest expansion is another very telling COPD symptom. It happens due to expansion in the size of the lungs, which pushes the diaphragm downward. The diaphragm can't function as it normally would, so muscles in the chest wall grow larger to help force air in and out. As mentioned previously, some of these COPD symptoms are not much different from the symptoms of other lung problems. Your physician, of course, is the only one qualified to evaluate your symptoms and give you a diagnosis.